A form of media blasting equipment, these devices use compressed air, pressurized water or rapidly rotating wheels known as blast wheels to propel abrasive grit toward the object or surface. The pressurized stream produced by grit blasters can be adjusted to accomplish a variety of tasks such as removing coatings, roughening smooth surfaces, smoothing rough surfaces, etching, carving, degreasing, deburring, peening, deflashing and descaling equipment and parts made of metal, wood, plastic and glass. As both heavy duty and precision parts can be maintained in this way, a number of industries find several applications for these machines. Automotive, shipbuilding, construction, agriculture, industrial cleaning and processing, aerospace, decorative design, woodworking and glass industries resurface and clean large and small elements including nuts, bolts, decorative glass, printed circuit boards, engine components, ships, bridges, aircraft, heat exchangers and building components. Because both the abrasives and the material construct of the receiving substrates vary, it is important to consider both the blast pressure and level of abrasiveness to enhance performance and eliminate any and all risk of damage to the product or part being manipulated. 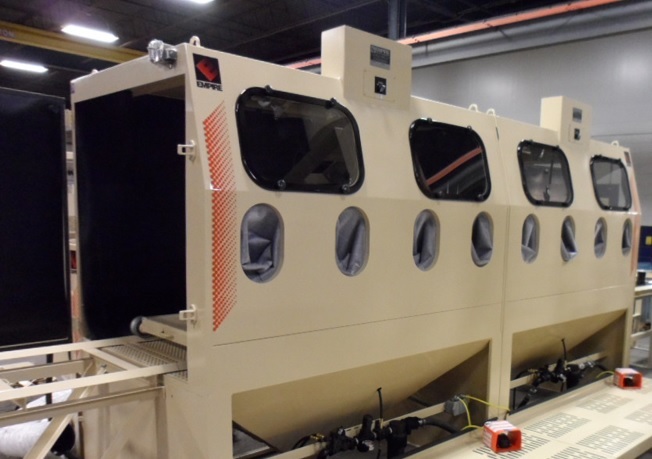 Though often referred to as sandblasters, grit blasting operations utilize a wide variety of abrasive media to carry out application specific tasks. Silicon carbide, for example, is an extremely hard ceramic grit that is used to scour durable materials such as steel. Baking soda on the other hand is a mild abrasive used on more sensitive materials. Dozens of other grit media are used including aluminum, carbide, ceramics, copper, glass, iron, gold, plastic, steel, wood, acrylics, silica sand and even nut shells and fruit kernels. These materials are flaked, pulverized, atomized or otherwise reduced to a fine dust or powder, the grains of which vary in size. Grit material is an important consideration when selecting a grit blaster as some can handle only one type while others are multi-media. In either event, the basic function of this sandblasting equipment is the same. An air compressor or pressure generator is connected to a power source as well as a hopper or vessel containing abrasives. Hoses of varying length connect the hopper to a nozzle which may be contained in a sandblast cabinet if the grit is to be collected for reuse and if size permits. Pulling a trigger or pressing a switch pushes or pulls air or water through the gun creating a vacuum which pulls the abrasive grit through the tubing and out of the nozzle in a high pressure stream directed towards the substrate to be cleaned or resurfaced. Though this is a general explanation, specific machines will vary and should be considered in relation to the intended goals of the process. Grit Blasters Grit blasters are machines of varying size and design that utilize high pressured streams of abrasive materials and slurries to clean or otherwise resurface industrial parts, products and components.